Cosmetic dental procedures can repair chipped teeth and restore a healthy shine to discolored or stained tooth enamel. Our dental practice specializes in the design and application of porcelain veneers in Peoria to help you look your best and to manage minor issues with misaligned teeth, chipped enamel, and persistent stains. By working with our knowledgeable dental professionals, you can enjoy the greatest confidence in your appearance and the benefits of healthier teeth every day. Here are some key facts you should know if you are considering porcelain veneers and other cosmetic procedures in our area. 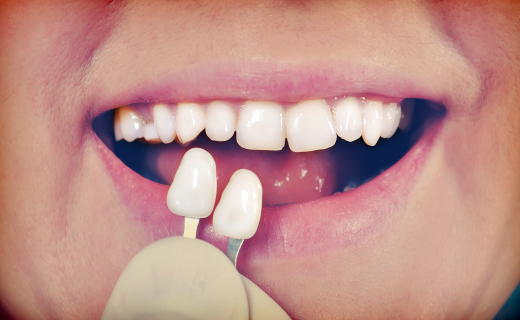 Veneers are often confused with bonding processes because of the similar results these dental procedures produce. Porcelain veneers consist of a thin ceramic shell that is fabricated to fit tightly over your natural teeth. These veneers can cover chips, stains, and minor alignment issues for front and side teeth, creating a uniform smile and a more attractive look. Bonding procedures, by contrast, involve the application of a composite material directly to the teeth and the shaping and smoothing of this material in place. Porcelain veneers take somewhat longer to complete, but typically last for a longer period of time and look more natural for most patients. Your porcelain veneers cost will vary depending on the number of teeth to be treated and the extent of preparation needed for these procedures. Your dentist will discuss all aspects of your porcelain veneers treatment plan with you, including payment plans and financial arrangements that can make these cosmetic appliances more affordable for your family. We will work with you to ensure that you receive the best services and the most appropriate treatments for all your dental needs. Your dentist will evaluate your current state of dental health, including the state of your teeth and gums. This will provide a baseline from which your treatment plan can be established and the most practical solutions for your dental issues can be identified. If porcelain veneers are right for you, your dentist will set up an appointment to shave away a very thin layer of tooth enamel from the areas where these dental appliances will be applied. Molds and photos may also be taken during this appointment to ensure the best fit for your fabricated veneers. When your porcelain veneers are ready, your dentist will use specialized adhesives to affix these appliances directly to your teeth. The adhesive material will be matched closely to your own tooth color to provide a more natural look for your smile. Our experienced dentists will work with you to ensure that you understand the entire process from start to finish and that you are fully satisfied with the care you receive from us. Your dentist will discuss a variety of options for correcting stains and chips in your front teeth and enhancing your smile, including replacement porcelain teeth, porcelain crowns, composite bonding, and porcelain veneers. Of these options, porcelain veneers can often provide the most natural results and the greatest longevity for your dental work. Once your veneers porcelain procedure is complete, you can care for these dental implants in the same way in which you treat your natural teeth. Brushing, flossing, and regular visits to your dentist can ensure that your smile stays bright and beautiful for many years to come. Contact us today to discuss your dental needs and to set up an initial consultation for porcelain veneers and other cosmetic dentistry options. We look forward to the chance to work with you.